Summary: Bit of a short week with holidays, the Vegetarian Festival, financial meetings with Golf, and Amanda having to make a visa run, but we made a deal with Baw and Houa that if they finished all the foredeck work (including the fo'c's'ls) by 2 November then we'd give them a $330 bonus, and this has energized them considerably. 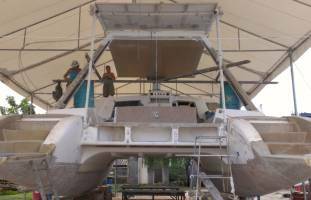 We hoisted the bimini up and set it in place so we could see how it fit and start planning the forward supports. 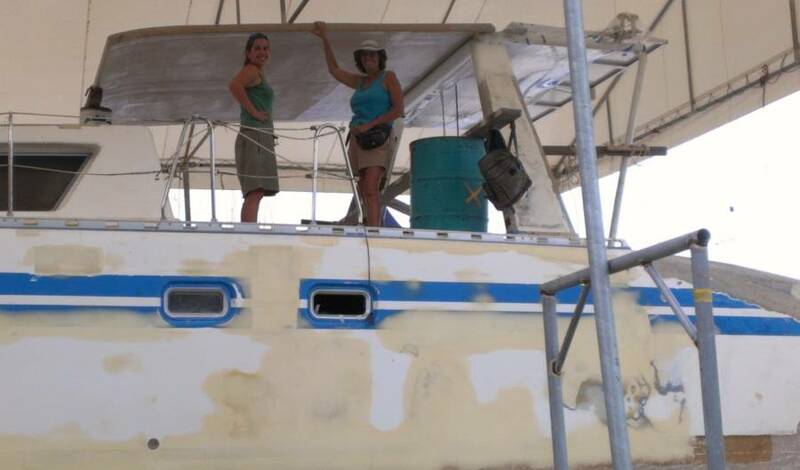 We also glassed split PVC pipe to 3 sides of the bimini to act as bolt‑rope holders for side‑shades and the dodger. Baw and Houa finished glassing in the last 2 hatch rims and then started on the foredeck, laying a decorative strip of foam on each side just at deck level and filling in the slight dish in both bows with epoxy fairing compound. Houa shrank the access hole above the new tank area on port so the hatch will clear the shelf that will go above it, and Baw started building the hatch, glassing over a foam mold (some of the foam will be removed later). We spent all of Friday moving all our junk from Manoon's land to a small apartment we've rented right next to the boatyard. Golf got us some stainless steel plates to reinforce the new pad‑eyes, and Jon started cleaning up the edges. Monday was a Buddhist holiday, so no work happened except Jon coming in to work on the mast some more. 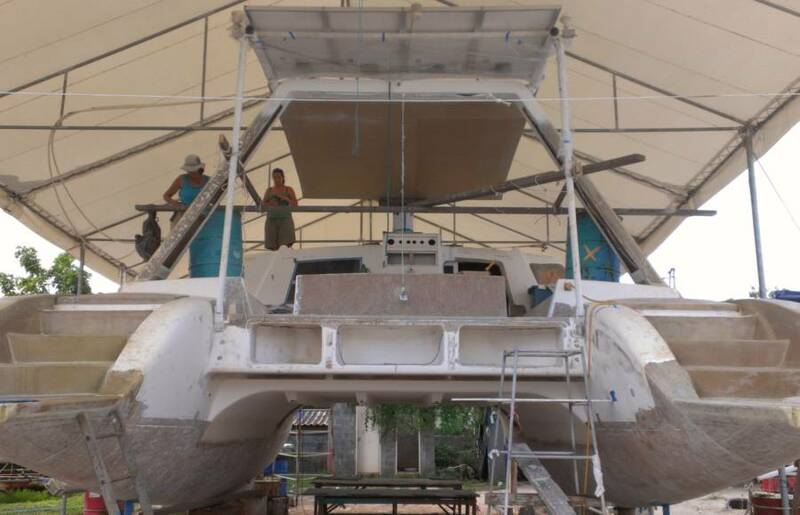 Our exciting news today is that we lifted the bimini up and put it in place on Ocelot! We wanted to see how it fit, how it would look, and how we want to build the front supporting legs. Two people can lift the bimini, but hoisting it up on deck and then positioning it on the targa bar required more people. We're very pleased with the shape. It continues Ocelot's lines in a nice way. Cutting away the foam at the back so just fiberglass is sitting on top of the targa‑bar seems to have been the correct decision. There is enough of an angle where the bimini meets the targa‑bar that we'd have had significant issues if we'd tried to come straight off the targa‑bar. The bits of foam that we left at the aft edges of the bimini now frame the davit supports nicely. Unfortunately, there's a lot of clutter around so it's difficult getting a good shot. We still have to design the forward supports, but we have some ideas that should be both structural and aesthetic. We also need to attach rails on the front and sides for the dodger and the side‑flaps to attach to. We were hoping to glass in small PVC pipes for this, but we can't find any small enough, so we'll have to get creative. 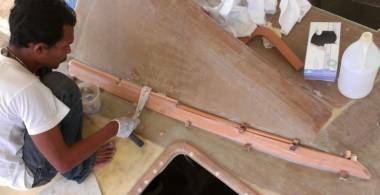 Perhaps we'll take the ½" pipes that we can get, split them lengthwise, glass them to the edges of the bimini, and cut slots in them later for the cloth to slip into. 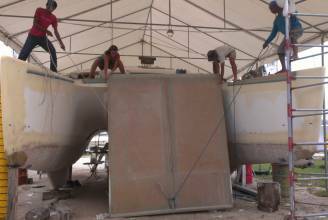 Once Golf has gelcoated the bimini, we'll mount it and start working on the forward supports. In other work, Baw and Houa glassed in the remaining 2 hatch rims, so that job is finished. Once the hatch rims are sanded they'll need some gelcoat so they look nice. Jon showed Amanda how to polish the mast, thereby depriving himself of a frustration outlet, but after lunch she joined Sue in cleaning up the hatches. So we had another meeting with Golf about finances. We need to work out a plan where he gets paid, the workers get paid, and Ocelot can be finished, ideally within 3 months. 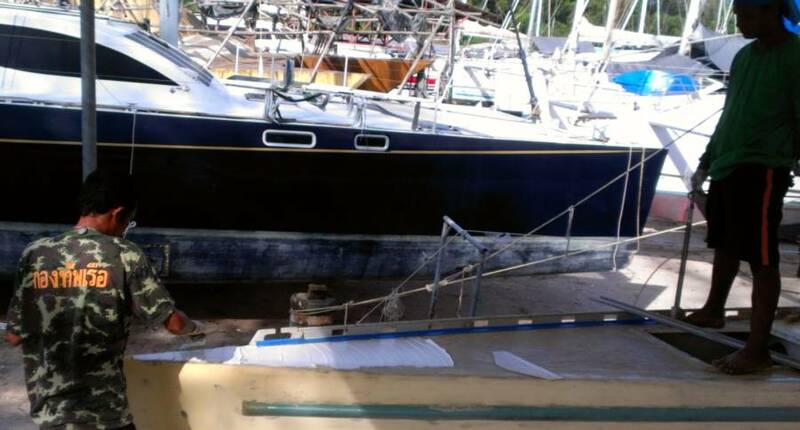 Golf has more work coming - a boat that he'll be painting is due to be hauled out tomorrow - but paying our workers out of profits from other jobs sounds dodgy. Golf's so easy going that he probably doesn't bid as much as he should. He'd probably do it for room and board, just so he can work on boats (which he truly loves). 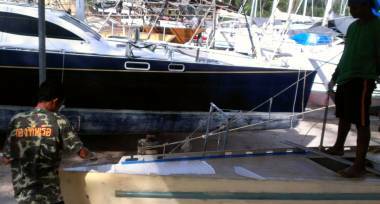 So in the afternoon Baw and Houa worked on the foredecks. These each have a slight dish in the decks, which needs to be filled in before the final layers of fiberglass go on. So they mixed up some epoxy sanding filler and smeared that over the foredecks. Tomorrow they'll sand it smooth and then they'll cover both bows in their final 2 layers of biaxial glass. Jon worked on the bimini. We need to attach shade cloths to each side, and we need to attach the dodger (cloth and plastic windscreen) to the front. 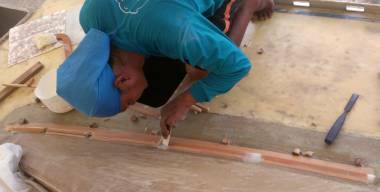 The easy way to attach cloth to fiberglass is to create a bolt‑rope - wrap the edge of some cloth around a string (rope) and sew it tightly, so the cloth now has a lump along one edge. Then create a slot for that lump to slide into. The string prevents the cloth from pulling out of the slot. For our slot, we decided to take some ¾" (19mm) PVC pipe, slit it in half lengthwise, glue the half‑pipe to the edges of the bimini, and then glass the pipe over. 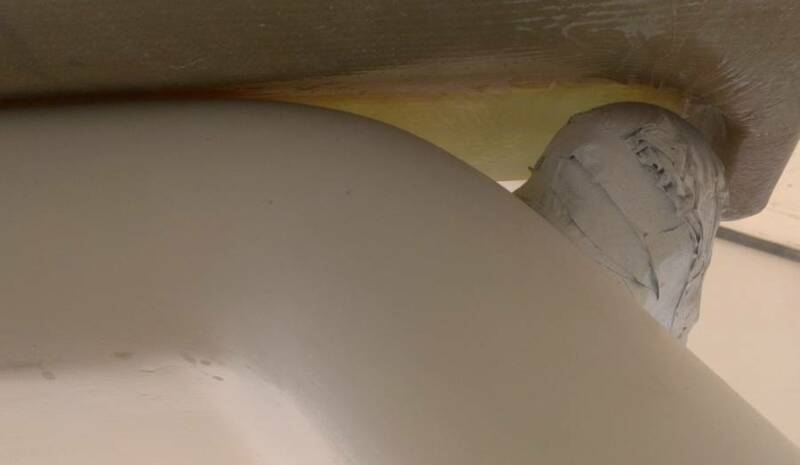 Once the epoxy has cured, we'll cut a slot in the side of the glassed pipe, down to the hollow interior of the half‑pipe. Sand the slot to remove any sharp edges and we'll have a bolt‑rope holder nicely molded into 3 edges of the bimini. 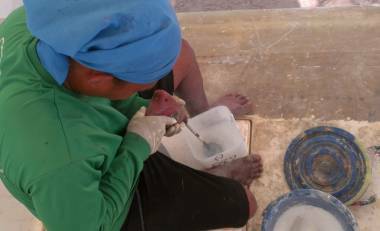 Although Houa's makeshift table‑saw could cut the pipe in half easily, the blade would eat 3mm (1/8") of the interior space of the pipe, so Jon decided to slit the pipe with his hacksaw. A somewhat time consuming process and it's very difficult to cut a straight line lengthwise through a pipe, but looks don't really matter since the pipe will be completely glassed over. So after buying two 4m (13') lengths of pipe, we now have 4 half‑pipes, all sanded and ready to go. 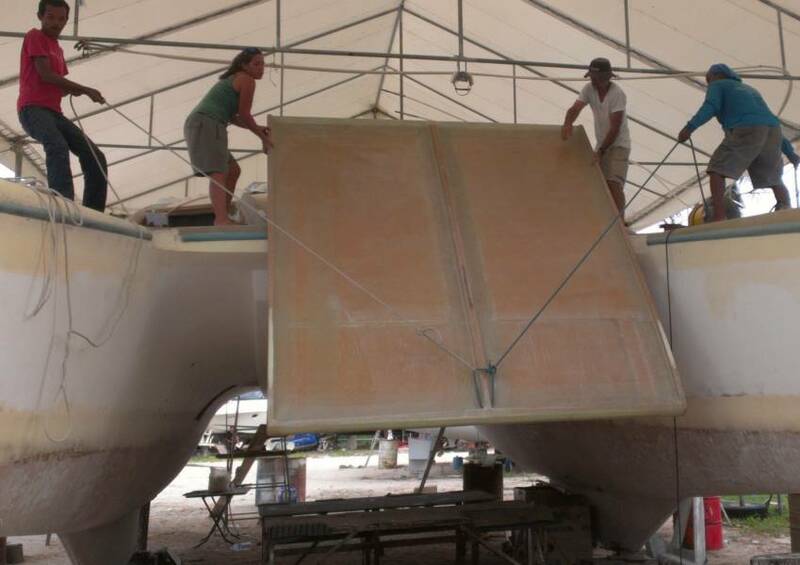 Tomorrow we hope to attach them on the 3 sides of the bimini with super‑glue before smearing some mud into the corners and glassing them over. No Amanda today, as she's making a visa run. The Thais allow you to have multiple Thai visas in your passport (as Amanda does) but they make you leave the country between each visa. How silly is that? So Amanda had to pay $50 to spend a day in a van driving (madly) up to the Myanmar border and back again. It's cheaper going to the Malay border, but that's a Muslim area of Thailand and there have been terrorist bombings in that area. We had a AMAZING surprise transformation in the workers today. It happened like this... We were talking to Golf about finances and needing a plan for finishing Ocelot. 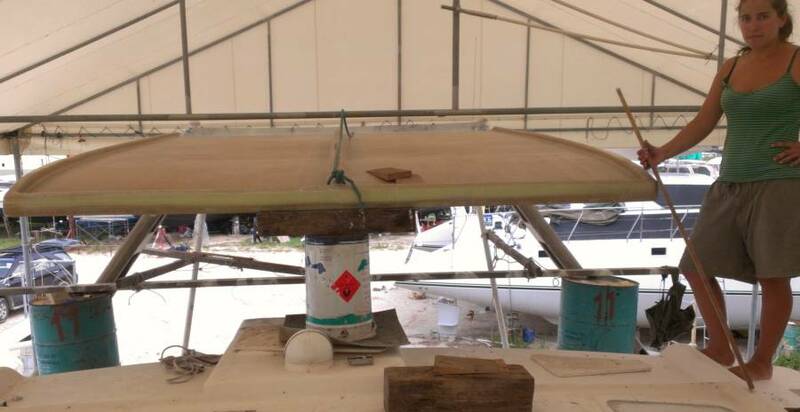 Golf had suggested that Houa and Baw should be able to finish the entire foredeck area in 2 weeks, but they've been pretty unmotivated (and unproductive) these last few weeks. So Jon told Golf that if the guys finished that foredeck area in just 2 weeks, we'd give Golf 10,000 Baht (about $330). To Golf's credit, despite being 3 months behind on his truck payments he responded, "Don't give it to me, give it to the men!" He asked if we were serious, we confirmed that we were, so he called Houa and Baw over. They'd been working on the extreme bows, filling in the slight dish that each bow has and now waiting for the epoxy mud to cure. Golf told them that if they finish the foredeck area (not just the bows, but the entire area in front of the salon, including hatches over the new tank areas) by 2 November, we'll give them a 10,000 Baht bonus. The transformation was amazing! Suddenly there was all sorts of activity. Instead of just waiting for the epoxy to cure, Houa drafted up a list of supplies that he wants to pick up in the morning, with estimated costs. Sue gave him enough to cover it (he'll return the change and the receipt, called the "bin", tomorrow). 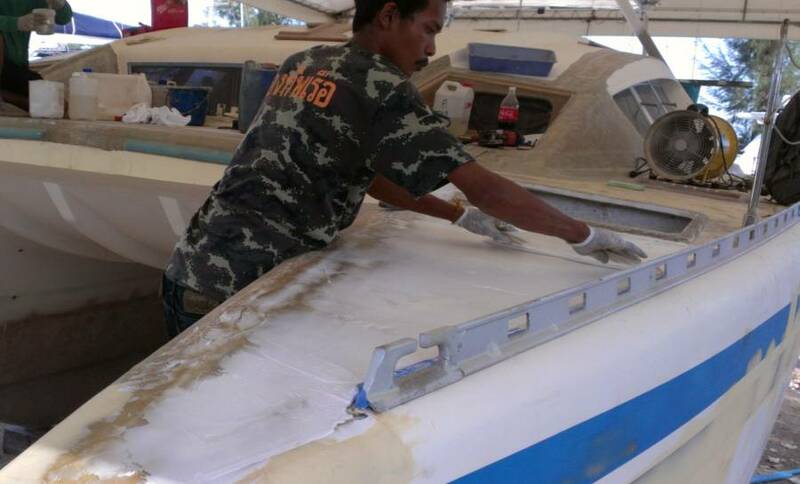 Baw started working on the little strips of foam (trim, really) next to the forward hatches. These small ridges had been ground back on both sides when we'd found some water under this area on port. They have no real function but they carry Ocelot's lines forward in a nice way. Baw got starboard side stuck down with additional bits of foam and epoxy mud. Then he trimmed up another piece of foam for the port side. Houa got working on the hole into the new tank area on port, just in front of our forward port‑lights. The hole needs to be shrunk down a bit so when the new hatch opens, it will clear the shelf that's going in above the port‑light. The hatch needs to be built to fit, with gutters around the inside of the hole. Starboard side already has much of this work done, but it needs to be finished - the last 10% that seems to take 50% of the time. Sue continued her work on the hatches. Cleaning ALL the old silicon off the old hatches takes forever. 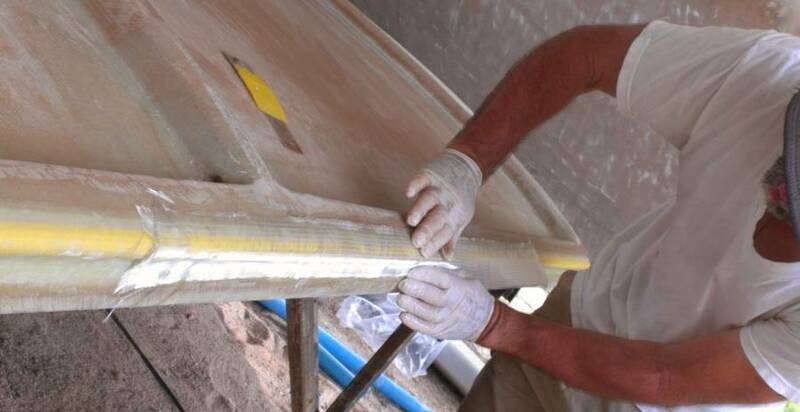 Jon continued working on the bimini. The cuts he'd made yesterday in splitting the pipes for the bolt‑ropes were rather wobbly, so he long‑boarded them flat. Then he fitted them to the outsides of the bimini, bending them down at the front to follow the bimini's curve. Then he used super‑glue to hold them in place - a trick we've learned from Golf and his team. Much of the rest of Jon's day was spent measuring and cutting the fiberglass strips that we'll epoxy over the half‑pipes. A small Dean catamaran from Australia got hauled out today. He apparently wants a fair amount of work done. Several contractors are hoping they'll get the work, but Golf seems confident that he'll get it. If so, it will bring some much needed cash‑flow to Golf's operations. Tomorrow will probably be a moving day for us - moving all our junk from Golf's old storage unit (a house on Manoon's land) to a small 2 room apartment right next to the boatyard. Exhaustion! Today was the much awaited moving day, to bring our stuff closer to Ocelot. Thank goodness it didn't rain! Golf is being charged $225/month to store our stuff, which is almost as much as we pay for our apartment (which includes TV, air‑conditioning, hot showers, 24 hour security, WiFi, etc). It's also about 3 miles (5km) from the yard, and we want our stuff more accessible as we put Ocelot back together. So we're renting a small apartment right next to the yard for $90/month. We had hoped to start moving our junk early, but in fact it was about 10:30am before Golf could organize the truck and a helper for us. Jon and Amanda went to the old storage unit on the scooter and met the truck and driver and helper, Bang, out there. First we found that a puppy was inhabiting our dinghy. Then we found that a calico mama cat had moved into our storage room with her 3 kittens. The kittens were totally cute, still palm‑sized, so they're probably only a few weeks old. We loaded up the pickup truck with 2 loads before lunch, then another 4 loads in the afternoon, finally finishing around 6pm. Sue and Amanda stayed at the new unit (one of a long string of small apartments right next to the boat yard) to organize the stuff as it arrived. 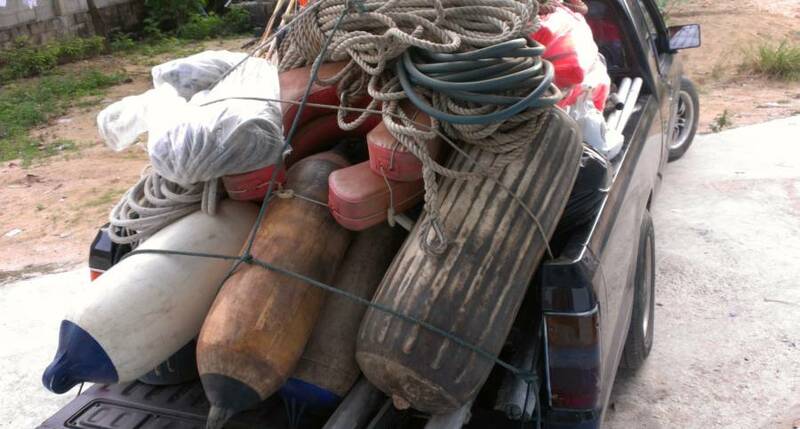 They sorted it into things to be ignored, things to go back on the boat, things to be varnished, cleaned, etc. We were lucky to be able to store the dinghies at our apartment complex in the parking garage, so we don't have to worry about the inflatable outside in the neighborhood where kids, dogs, and chickens would all play in it. Whew! What a day! We can't believe all that stuff goes back on Ocelot! Meanwhile, up on Ocelot, Baw and Houa were still fired up with their promised bonus. More sanding and fairing and mudding happened on the extreme bows. They got some work done on the new hatch area, with foam put in the large locker opening on port. 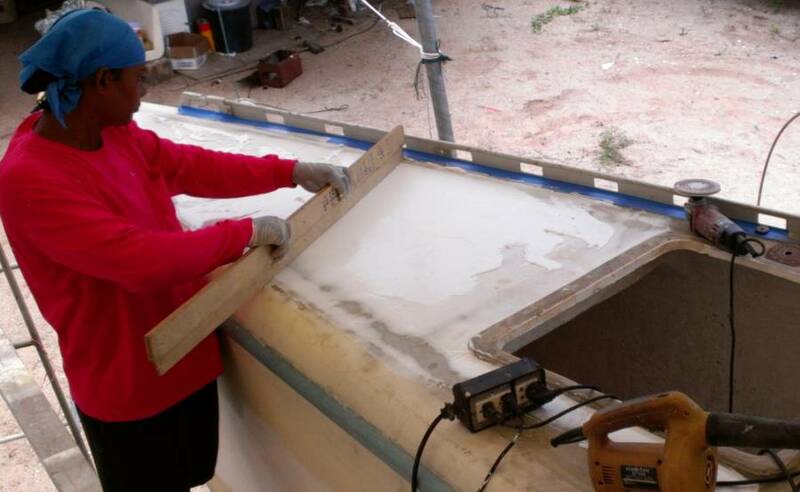 And Baw did a nice job of creating and epoxying in the raised foam edges on port and starboard. Golf picked up two nice stainless steel plates for us, which we'll be putting inside the fo'c's'ls to back up the pad‑eyes for the new prod. They're pretty massive, at 7" (18cm) square and 3/8" (9mm) thick. So now that the move is over, we'll be concentrating on finishing the two prod pad‑eye areas. Only a half day, really, but we made some good gains. With the Phuket Vegetarian Festival on, Baw and Houa were away all morning having fun with the festivities, and Jon had a morning dental consultation to see about an implant. After lunch, Baw and Houa returned and opened up the tool locker. 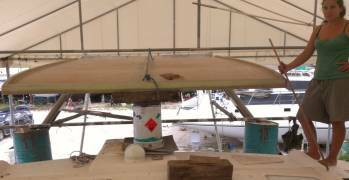 We decided to finish the bolt‑rope holders on the sides of the bimini, glassing in the PVC pipe that we'd super‑glued to the sides of the bimini on Thursday. We asked Houa for some epoxy mud (we still prefer the guys to mix this epoxy up) so we could make nice filets on either side of the pipes. Then we epoxied 2 strips of biaxial glass over the pipes. Jon's still unsure if this will be strong enough, but it's easy enough to check once the epoxy has cured, and it will be easy to add another layer of glass if it becomes necessary. Baw was thinking hard about the hatch for the new tank areas just in front of the main cabin. Max made one for the starboard side back in May, but it will need some modifications before we can use it because the foam on the top and sides is too thick. Baw was working on the portside hatch. He eventually decided to make a foam mold and then glass the outside. Next week he'll remove the foam where it's not needed (mostly around the edges) and then glass the underside of the hatch. He'll also have to make the gutters that go under the hatch, as that area sometimes gets inundated with water. Houa helped us with the bimini for a while, but then went to work up on deck. Now that we have this incentive program going, it's not fair for us to take them off their work, as they'll be pushing hard to finish on time. Yesterday they used small wooden blocks super‑glued down to the deck to hold strips of foam in place while the epoxy cured. Now that the foam is epoxied down the blocks aren't needed, so Houa chipped them out and filled the holes where they were with epoxy mud. A bit more sanding and those areas will be ready to glass in. Another of the list of jobs that Houa and Baw have to finish before 2 November if they want their bonus is the shelves in both fo'c's'ls. The shelf in port was completely ripped out and Houa has built an elaborate foam and glass replacement. 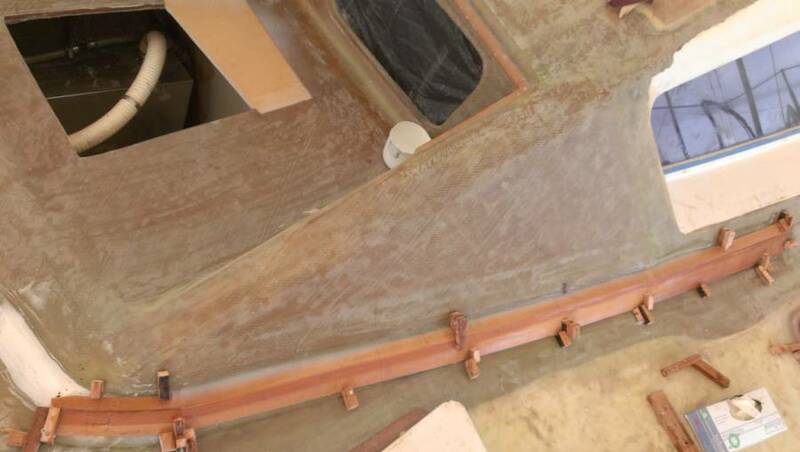 The shelf in starboard is mostly OK but we cut out a section right up at the bows so we could work on the pad‑eyes that will hold the prod down. So we need to quickly finish reinforcing the hull where those pad‑eyes go so the shelves can be finished. 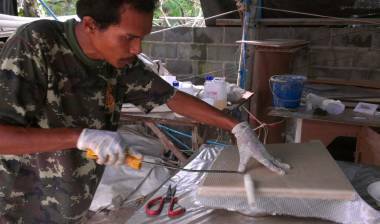 We cut the foam away from the inside of where the pad‑eyes will go and we've been filling up where the foam used to be with fiberglass. That job's almost finished on port but still has a ways to go on starboard. 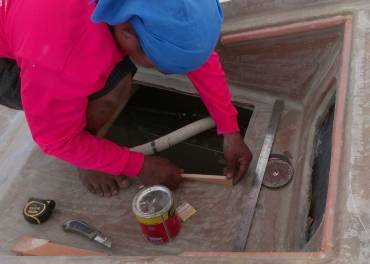 Once we finish filling the holes with fiberglass, we need to stick stainless steel plates on the inside. These will nestle up against the crush spaces forward, and just below the fo'c's'l shelves. Golf brought us a pair of stainless plates, but the guy cut them out of a larger plate with a cutting torch. This is an oxygen‑acetylene torch with an extra oxygen jet. 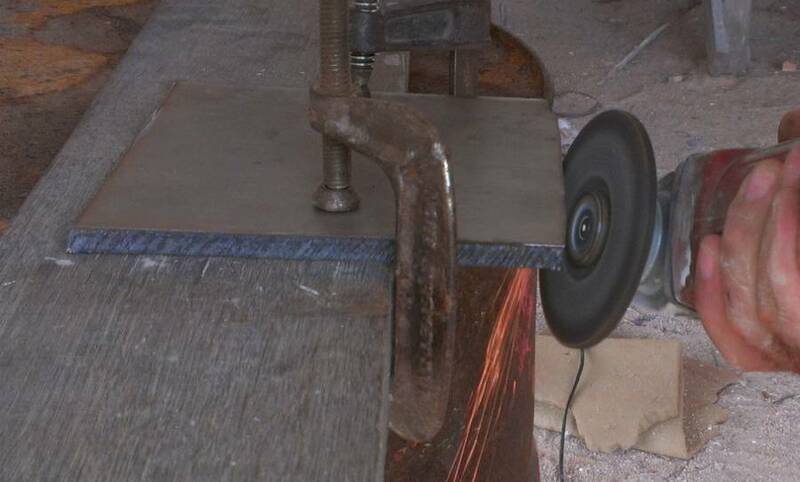 You melt the steel with the normal oxy‑acetylene torch, then trigger the extra oxygen jet, which blows the molten steel out of the way while it super‑heats the flame, allowing a fairly rapid cut. The problem is that melting stainless steel in the presence of oxygen makes the steel no longer stainless. So we have to grind all of sides where the cutting torch was used, until we get back to native steel. 316 Stainless steel is so tough that this takes a lot of time. Jon worked with a grinder for over an hour and only got 1 of the 7 sides ground back.